Per Night, varies by date. We discount every order that includes shows & lodging! Call our local experts to find out how much we can save you! 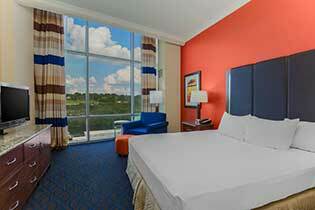 The Hilton Promenade Hotel is your premium choice for lodging in Branson, with its beautiful view of Lake Taneycomo! Flowing river-like through Branson, the lakeshore is home to Branson Landing where the Hilton sits as centerpiece of this popular shopping and dining destination. You can enjoy great views of the Landing and the lake beyond from your hotel room; perfect for people watching! With plenty of activities at the Landing, including free concerts and a stunning water and light show set to music; you’ll always have something to keep you entertained! You’re also right in Historic Downtown Branson; brimming with shops, cafes, and shows, it’s a great place to spend a few hours strolling around. 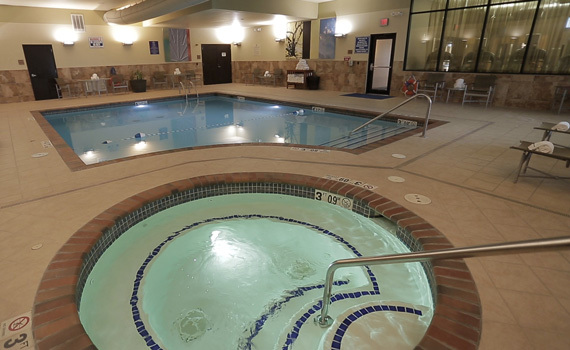 Few options for lodging in Branson can offer so much on your doorstep! 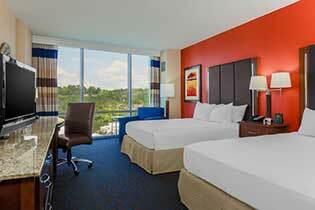 Guest rooms at the Hilton Promenade Hotel feature upscale, contemporary furnishings with rich colors and textures. Amenities include everything you’d expect with the Hilton name, including their coveted Hilton Serenity Collection bedding with pillow top mattress, down comforter, and luxurious triple sheeting. 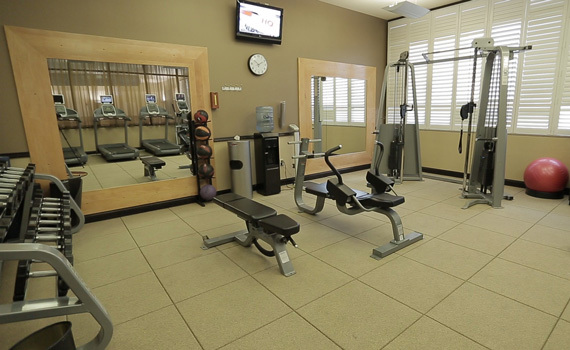 You’ll also find flat panel televisions, spacious bathrooms, an excellent work desk, and other quality touches to make your stay extra special. 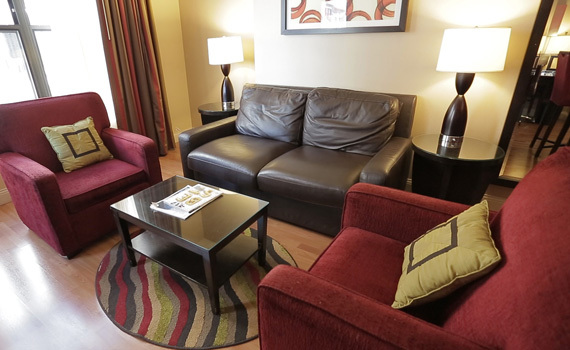 For extended stays, or if you’re bringing the family, try one of the king condo suites with a fully equipped kitchen. 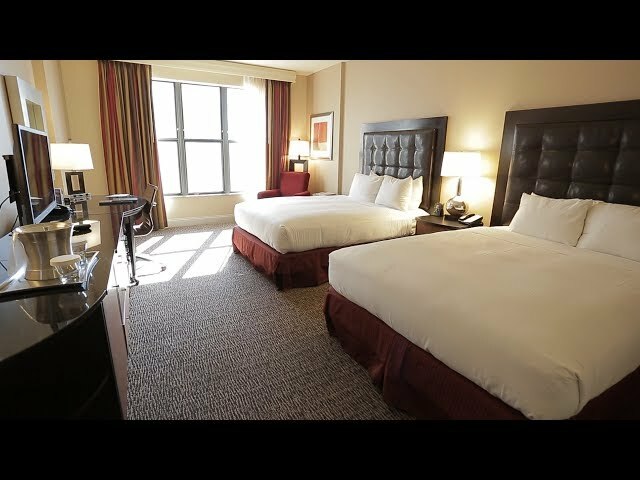 You’ll find a wide variety of high quality lodging in Branson, from hotels to cabins, from condos to campgrounds, but few compare with the dependable luxury of the Hilton brand. 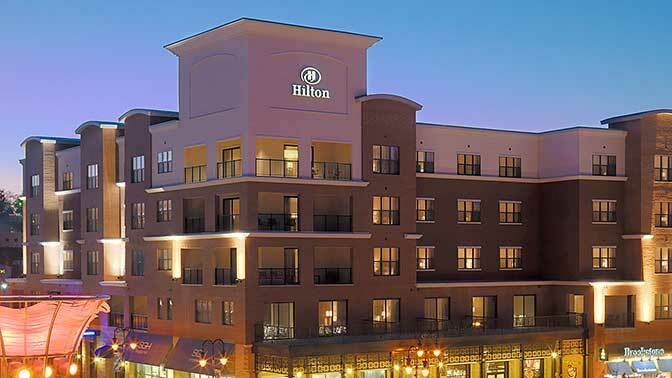 The perfect choice for the quality minded business or leisure traveler - the Hilton Promenade Hotel! 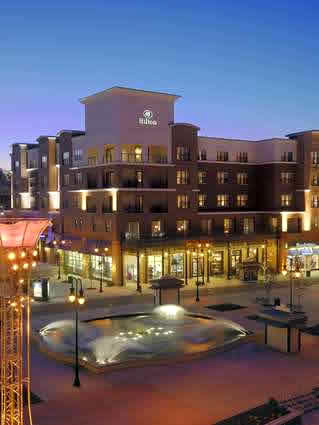 Find out more information about lodging in Branson and vacation packages at Branson.com. ***4 Day Cancellation on ALL reservations which is not covered by Trip Protection. Any cancellation within the 4 Day Cancellation period will be charged for the entire reservation. 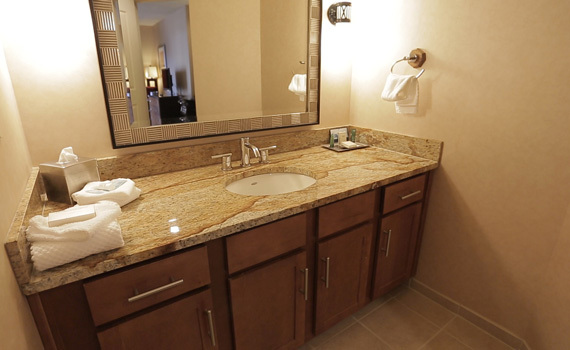 32-inch TV, Hilton Serenity bed, extra-deep tub, work desk, mini-fridge. 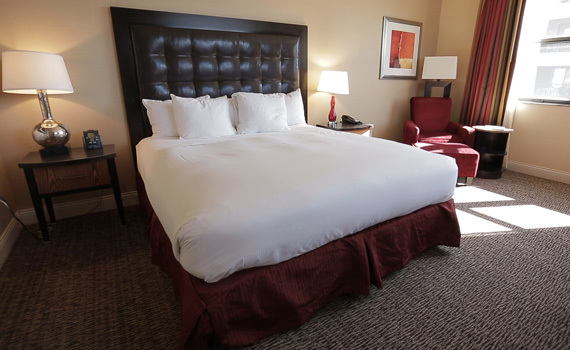 This king bed Branson hotel room offers the ultimate comfort with the Hilton Serenity bed. Watch a movie on the 32-inch LCD TV or catch up with work at the desk. Special touches include a mini-refrigerator and comfy armchair with ottoman. The stylish bathroom also features an extra-deep tub. 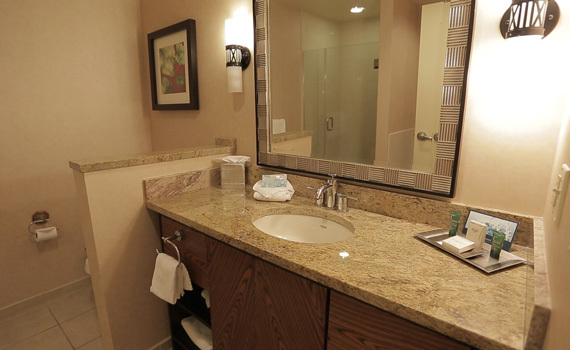 32-inch TV, Hilton Serenity bed, extra-deep tub, work desk. 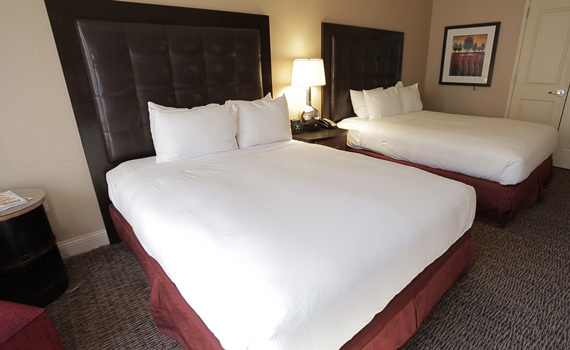 This double queen-bed guest room offers the ultimate comfort with two Hilton Serenity beds. Watch a movie on the 32-inch LCD TV or catch up with work at the desk. Special touches include a comfy armchair with ottoman. The stylish bathroom also features an extra-deep tub. Balcony, 32-inch TV, breakfast bar, mini refrigerator, microwave, WiFi. Pamper yourself with a little more space in this superior guest room with two queen beds. 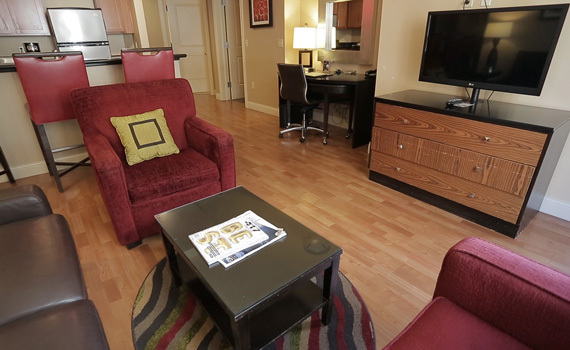 Take in the view from the balcony or watch a movie on the 32-inch LCD TV. WiFi access is also available (fees apply). Additional features of this room include a breakfast bar with microwave, coffeemaker and mini-fridge. Experience the ultimate comfort in the Hilton Serenity bed. 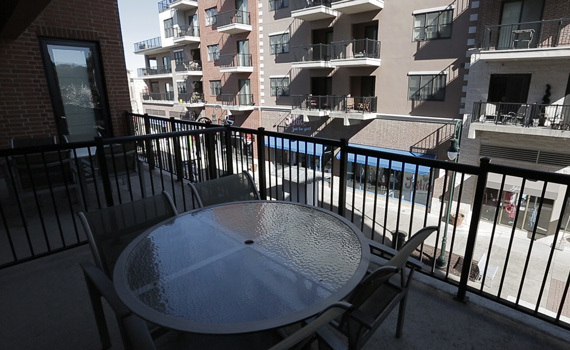 Balcony, full kitchen, two 32-inch TVs, WiFi. Experience the comforts of home in this one-bedroom condo. The room features a full kitchen with cook top and oven, microwave, dishwasher, refrigerator and wet bar, as well as cooking and dining utensils. An outdoor balcony provides extra space. 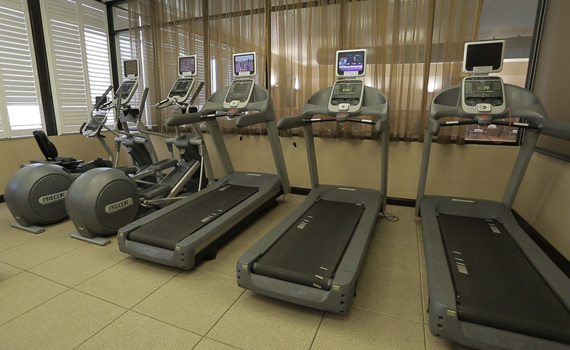 Additional features include two 32-inch LCD flat-screen TV's and WiFi access (fees apply). Experience the ultimate comfort in the king-sized Hilton Serenity bed. Balcony, 32-inch TV, breakfast bar, mini refrigerator, microwave, WiFi. Pamper yourself with a little more space in this superior guest room. 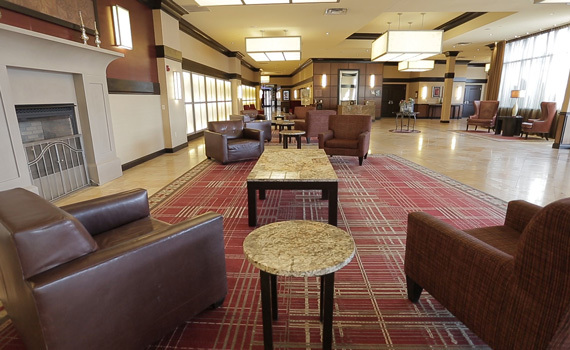 Take in the view from the balcony or watch a movie on the 32-inch LCD TV. WiFi access is also available (fees apply). Additional features of this room include a breakfast bar with microwave, coffeemaker and mini-fridge. Experience the ultimate comfort in the king-sized Hilton Serenity bed.